Yeah, definitely! I'll start working on Takeru's bio and general pre-production on DRGN in general soon, hopefully that help in the next fight giving Flare somewhat more fleshed out abilities. I was actually betting on my Flare to squeeze out a win against yours as well, thinking his adaptive armor and magitek would carry him through. Great fight though, your Flare one fair and square and the fight was tighter than either of us were probably thinking. Certainly! I'll send the fight scene by you before posting. It'll be great to have someone else on the judges panel to discuss results with! Welcome aboard! It was a close fight. What really decided it was the arena with the smoke and plenty of space for girl Flare to spread her wings. In an enclosed arena like Amaterasu's Matsuri or Inside the Seal your Flare would have won. Also, came up with two more arenas that could work. The extensive ruins of a once beautiful futuristic castle located deep within the strange and dangerous Deadwood Forest, a mysterious forest that was said to have been created from the corruptive influence caused by the sealing of the Netherworld at the end of the Great Netherworld War a thousand years ago. Inside the castle lay the remains of an abandoned laboratory that belonged to King Gufuu, former high king of Anticthon turned tyrannical Lord of the Netherworld. There, he created many strange and horrific living weapons and kept them there. Rumors also circulate that some of said experiments still roam the depths of the castle and surrounding forest. Not at all! Anyone is welcomed to be involved! What are your series and characters? Great to see you aboard! Circe vs Flare (girl) feels like a match that needs to happen sometime! Great arenas! One small and one enormous. Downtown Minneapolis reminds me that we need to be on the look out for giants and giant monsters now that we have arenas big enough for them (Downtown Minneapolis and Fantasy Plaza). I'd also alter Downtown Minneapolis slightly so that the fight starts in the sports stadium and can fan out into the city at large just as the fight in Fantasy Plaza starts in Fantasy Plaza and can fan out into Flavorcity. Think we could also put Selena in the green room? Or is that just for characters who definitely have opponents coming up? Oh no, Green Room is the "guys we need to find fights for" room so Selena totally goes in. Sorry I forgot her! Ok, cool. Thanks! Can't wait to see her's and Alpha Alpaca's opponents! @OttoGruenwald I was also thinking that fights in Downtown Minneapolis would also start in the stadium before fanning out in the main city as well. Well @aqua03 , your character helped ruin the ruins at the other abandoned castle. I think it's only fair that you replace it. @AdrenalineShots, welcome to the club. The first rule of Tapas Fight Colosseum is that you don't talk about Diablo Infinity. Oh dear, you poor naive @OttoGruenwald -- you don't know about AdrenalineShot's mascot character. Your parents never warned you about girls like Mistress Morphine. Proposal: Miss Morphine versus Zone-tan in a cheesecake factory. I kid! I'm just kidding. It should actually be me vs. Zone-tan in a cheesecake factory. Now, we should all go back to being good boys and and continue pretending that we do not know these characters. Amysgames is onboard! Sanori has joined the brawl! Sanori is very excited about it, I'm sure. She doesn't have any superpowers or anything, which could be a disadvantage... but it looks like you guys have been discussing that already, so cool! 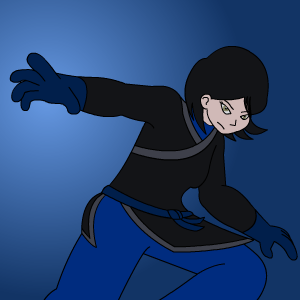 She's usually more inclined toward stealth than direct combat, and won't kill someone unless she feels it's necessary. Stealth's not really an option here obviously, but she'll probably try to keep her distance whenever possible. She's pretty resourceful and might try to use the environment to her advantage. Her weapons are a katana and some shuriken (ninja stars). Personality-wise, she's pretty quiet. She's unlikely to have much dialogue. I'd love to be in contact to make sure she's in-character and stuff, but other than that, I can't think of much else to add. I'm excited to see how it turns out! It's great to meet you, @AmysGames. Sanori seems like a nice multi-faceted character. I look forward reading your comic. Quick question: I am assuming that we are matching characters from comics against characters from comics, novel characters against novel characters. Is that right? Panels Read from Right to Left (Like a Manga) Young Kenta Orune is a college student trying to make his dead relatives proud by getting his degree when he is thrust into a holy war that will decide the fate of mankind. We got a new creator involved! Kenta, soldier of Yahweh, has joined the brawl! He's also pretty powerful. Nothing short of an H bomb that isn't explicitly divine or demonic can crack his armor. I think we might have a good match for Thunderstorm/Lilly. Mighty armor vs glass canon. Both fighters are normals that transform into a powered form through armor/masks, and both fight as part of a team of similarly superpowered allies. Another creator has given the go ahead, bringing a cast of blue foxes to the brawl including the powerful Flash Gauntlet! Comics and novels can freely mix.